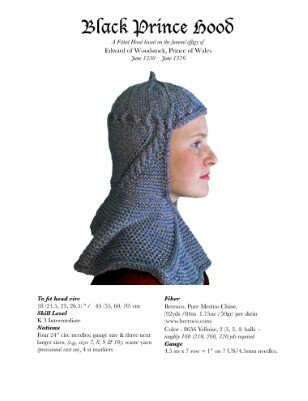 Based on the hood worn by the Black Prince of England (Son of Edward III) on his funeral effigy, this warm and fun hood will become a favorite gift pattern – after you make one for yourself! Beginning at the chin and working up , the sideband is created, then stitches are added at the forehead and the crown and tip are worked. The original cast on is used to work the neck and collar section.